Whether it is cards, cakes, carrots, chisels, chops, coffee, cushions or cuisine – our market stallholders stock the lot so please back them this Ourburystedmunds Independents Week (4-10 July). Next month sees a week long campaign designed to encourage more people to shop locally and to support their independent shops and businesses. In Bury St Edmunds, the Business Improvement District (BID) Ourburystedmunds has calculated that more than half of the town centre shops, restaurants, cafes and other businesses are independents and is calling on residents and visitors to show them their support. A competition sponsored by radio station RWSFM calls on people to vote for their favourite independent business, with the winner receiving £500 worth of radio advertising. 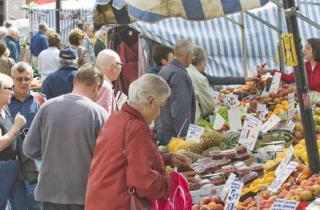 The town, however, also has a strong mix of retailers who set out their stalls and trade every Wednesday and Saturday. Bury St Edmunds has around 80 permanent stallholders and the market, which is run by St Edmundsbury Borough Council continues to be popular. As well as traditional stalls selling fruit and veg, pet supplies, fishmongers and butchers, the market now boasts an array of ready to eat World foods including Japanese Sushi, Thai noodles, handmade humus, authentic Mexican, local sausages, locally made ice cream, American pop corn and delicious doughnuts. Cllr John Griffiths, Leader of St Edmundsbury Borough Council said: “The mix of independent businesses in Bury St Edmunds town centre continues to be a key part of its success and alongside the arc shopping centre, the Apex, and the establishment of the Business Improvement District – all of which were spearheaded by the council – this has led to Bury being named one of the best town centres in the country with a shop vacancy rate well below the national average at just 4.7 per cent. “The strength of our market is crucial to that success and so we are backing the campaign, asking our residents and visitors to keep shopping local, enjoy the wonderful array of shops, cafes, restaurants and other businesses we have in the town centre, and continue to support our magnificent market traders.” Reusable bags will be given free to customers shopping on Bury market on Wednesday 6 July and Saturday 9 July, while stocks last.